Found this pretty coverlet at an auction that was described as a Vintage Hawaiian Coverlet from the 1930s. Very thin with just the front and back material (nothing in between). No clue if it is a Hawaiian pattern or not. Has both hand stitching and machine stitching. Any idea what this pattern might be and if it might be Hawaiian? True Hawaiian patterns are actually owned by the families. This could be someone's attempt at a Hawaiian style pattern but it lacks the intricacy of most authentic ones I've seen. It's pretty and you like it so just enjoy it for a summer coverlet or display it. I was thinking the same thing about it no being as intricate as the ones I saw when I was in Hawaii. I agree just enjoy it. There is at least one book called "Hawaiian Quilts Traditional to Transitional" I believe is the title. Having no middle layer does lend it a bit of credence. Of coarse you could always try to research if there is a museum in Hawaii with a strong textile department and email them and ask for their help. As the others have said, it seems a bit simple in style. Let us know what you learn about it. 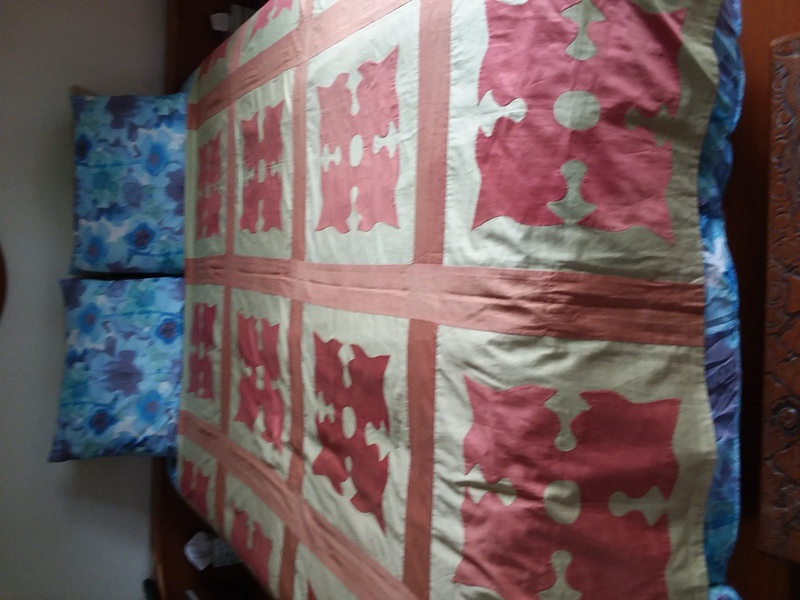 A "true" Hawaiian quilt is one large, intricate design. I agree that this is not as intricate as normal Hawaiian quilts I have seen.